About 10 days ago, we got some pretty good northern lights here in Whitehorse. I took some pictures using a timer remote control and stitched them together to create a video. Unfortunately, a hundred pictures usually result in a 5 to 10 seconds video so I added a few other pictures from that night to get a final video of 1 minute and 10 seconds. I added a soundtrack to it and uploaded it on facebook. The video got quite popular (more than 1200 shares after a week) so I decided to post it here for everyone to enjoy it. 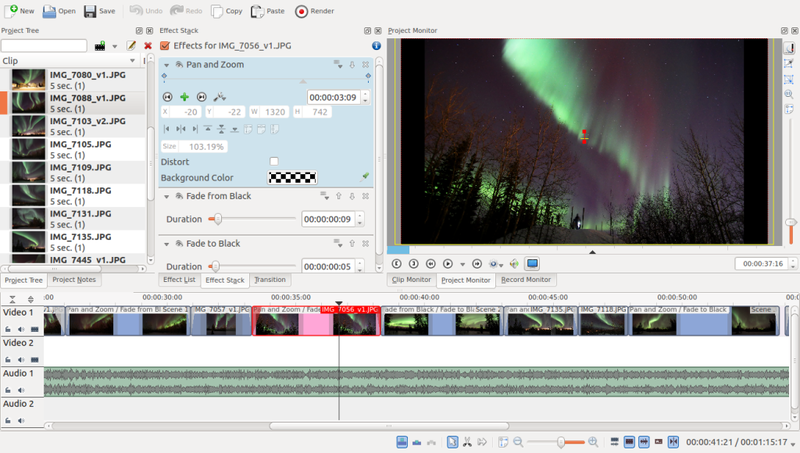 As for the editing, I used Kdenlive on Ubuntu 13.10. The interface is easy to use and the transitions and effects library is quite complete.